A press conference in March 2013 to address the issue of proper disposal of sanitary napkins. Photo credit: SWaCH. SWaCH waste pickers’ cooperative began bringing attention to a little known but very important issue more than two years ago: the proper disposal of sanitary napkins. Soiled sanitary napkins expose waste pickers, who work with their bare hands, to respiratory and gastrointestinal ailments, skin and eye infections and allergies. Three years ago, SWaCH members developed a low-cost, disposable, biodegradable paper bag with a yellow sticker that makes its contents recognizable to waste pickers. The cooperative already sells about 20,000 to 25,000 of these bags every month and has been trying to engage the companies that manufacture sanitary napkins to adopt them. These same companies have led aggressive campaigns to push their product in schools and colleges but have ignored waste pickers’ requests that they provide a identifiable disposable bag along with the pad. And they are actually required by the national waste law to practice producer’s responsibility for waste generated by their products. According to the provisions of Extended Producer’s Responsibility (EPR) included in the Plastic Waste (Management and Handling) Rules 2011, the producers are required to finance and organize a system for environmentally sound management of waste (especially non-biodegradable waste) generated from their products and to take responsibility for the end of life of their products. Quoted in the Times of India, SWaCH waste picker Rekha Sakpal, said, “These companies spend so much money on research to make the napkins comfortable for women to use. Why can’t they spend some money to ensure that the same are wrapped and disposed of properly?” Stree Mukti Sanghatana, a women’s organization that works with waste pickers, is also suggesting eliminating plastic from sanitary pads to make them completely compostable and recyclable. But no commitment has been made. After sending numerous requests (even the mayor of Pune and other municipal leaders reached out) to manufacturers of sanitary napkins and diapers — including Johnson & Johnson, Procter & Gamble, Hindustan Unilever Limited and Kimberley Clark Lever — with no response, SWaCH came up with a last resort. The cooperative collected used sanitary napkins and sent them back in boxes to the companies’ corporate offices as a gift on International Women’s Day to make them experience firsthand what waste pickers undergo while handling such waste. It was a step that finally worked. On April 4th, a representative with FIHA (Feminine and Infant Health Association) met with SWaCH, a commissioner with the Pune solid waste management department, and two organizations, Parisar and Janwani. In the meeting, FIHA representatives had to respond when they were questioned by SWaCH about which stream of waste (wet or dry) sanitary towels and diapers belong to. These large manufacturers had not even thought about this! “As manufacturing companies, it is your responsibility to ensure that the entire life cycle of your product is sustainable. The burden of handling and processing post-consumer waste is borne by waste pickers and the municipality!” said Ranjit Gadgil of Parisar. 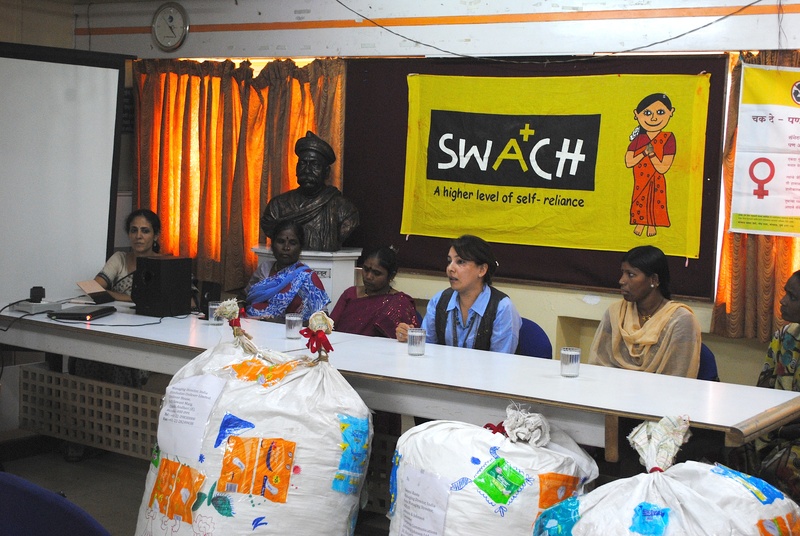 SWaCH members have also met with the state department of health, which has called for a consultation with waste picker organizations, experts and manufacturers on April 26th in Mumbai to discuss the issue at hand. FIHA members were told to develop a proposal with concrete steps and present it at this consultation. However, this meeting has been indefinitely postponed. At the press conference for SWaCH’s “Send it Back” campaign. Photo credit: SWaCH. A bag full of used sanitary napkins address to Proctor and Gamble, one of the companies that manufactures the product. Photo credit: SWaCH. This is my favorite campaign to date! Excellent strategy to send the napkins to these folks and force them to think about where these things actually go. Good luck with this important work.